Not all fairy tales have a happy ending — this is what Shelley Gallus discovers in “Before Ever After,” the debut novel of Filipino author Samantha Sotto. After her idyllic marriage is cut short by the untimely death of her husband in a terrorist bombing, Shelley has a difficult time moving on, overcome by grief and memories of their life together. One fateful day, her doorbell rings, and she finds the story isn’t over just yet – standing on her doorstep is a man who looks exactly like her husband. The stranger introduces himself as Paolo, claims her husband Max is his grandfather, and that Max is halfway across the world, alive and apparently well, and Paolo has pictures to prove it. Bewildered, and yet desperate for the truth, Shelley agrees to accompany Paolo to find the husband she believed dead. Along the way they exchange memories of the man they thought they knew, and Max’s identity is gradually revealed. Vivaldi has always been one of my favorite classical composers, so the book Vivaldi’s Virgins by Barbara Quick caught my eye at the NBS book bazaar a couple of years ago. 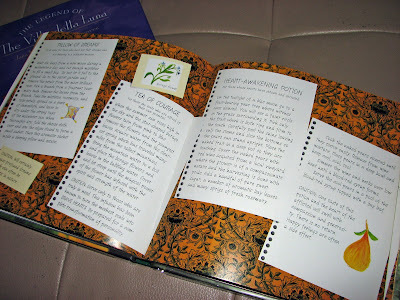 I finally got to read it last month, because I badly needed a Q for the A-Z Challenge. In my last entry, I talked about my growing pop-up collection. 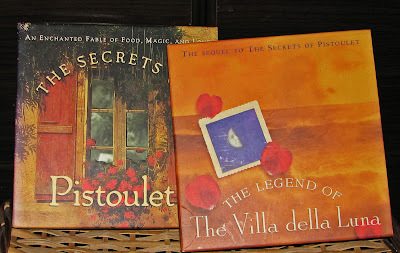 This time, I’m reviewing two illustrated novels that are part of my growing illustrated novel collection: The Secrets of Pistoulet: An Enchanted Fable of Food, Magic and Love; and the Legend of Villa della Luna: The Sequel to the Secrets of the Pistoulet (books #65-66 of 2009); both by Jana Kolpen (text and illustrations) and Mary Tiegreen (design). I discovered the books in Amazon, looking for illustrated novels, and I added them to my BookMooch wishlist until I was eventually able to mooch copies from two different users some several months apart last year. Book 2 arrived first and I shelved it until I got a copy of the first book, and so I wasn’t able to read them right away. 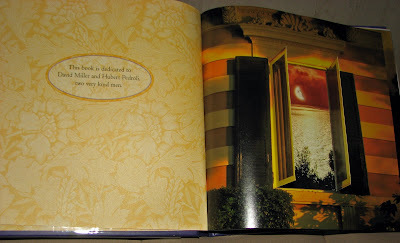 I was actually very excited to read the books because they were so pretty from the outside, with their own cardboard slipcase and a “peekaboo” window that showed a teaser portion of the back cover (see photo above). 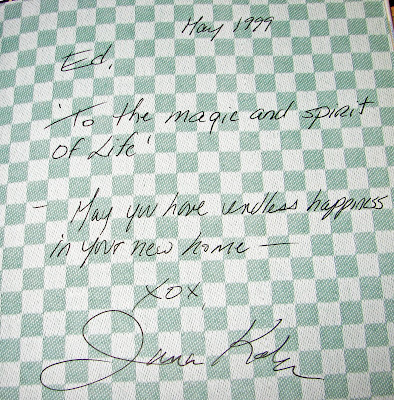 But as I turned the pages of the first book (my copy happens to have an inscription made out to a certain Ed, with the scrawling signature of Jana Kolpen underneath), I had a sinking feeling that the book wasn’t what I hoped it would be. 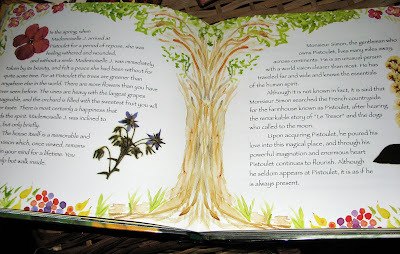 The story, done in the style of “Griffin and Sabine,” (it claims on the back portion of the slipcase) revolves around a certain “Mademoiselle J,” a guest who is said to be recovering from heartbreak and experiences Pistoulet’s magical healing powers. 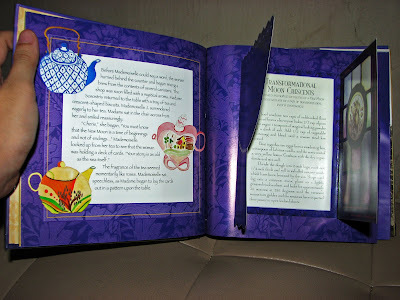 Interspersed with the narrative are recipe cards for different potages for a variety of functions, e.g. spirit, strength, heart, passion, etc.) containing real recipes that you can try out for yourself, fold-out letters that come in their envelopes, and even handwritten cards. 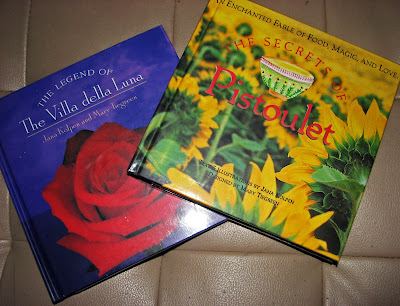 In the same manner, The Legend of Villa della Luna picks up where the first book leaves off, but is located in Italy, and is the continuation of Mlle. J’s journey to self discovery. 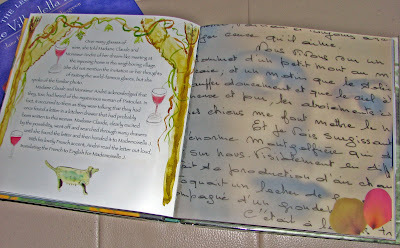 It was difficult for me to get into the book for two main reasons. 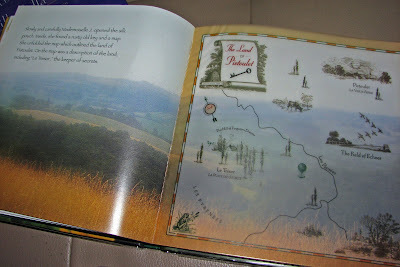 First, while the covers looked good, the inside pages were a hit-and-miss for me. 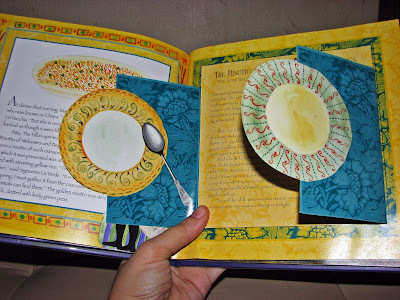 The text (which is in a hard-to-read calligraphic font) gets lost in a page that is cluttered with patterned backgrounds, elaborate borders, photos, and spot illustrations (i don’t really care for her watercolors), and sometimes the pages are downright garish or kitschy. Book 2 is marginally better-designed than the first, but still not enough to redeem itself, much less the series. Granted, the books were published in 1996, but good design should be timeless. And second, I just found the content hokey. I mean, I’m all for magic, food, love, but the books were like a hippie dream and I just couldn’t buy it. Nothing much happens in the story, just a lot of vague rambling thrown in with some new age philosophy. Sigh. 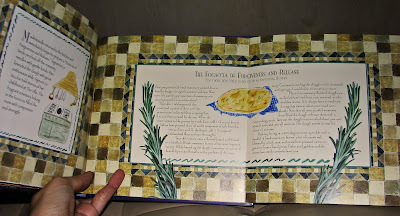 Nevertheless, because they’re still illustrated novels, the books are staying in my collection, and I might try a recipe or two one day, just to see if it really works. My copies: both hardbound in slipcase, both mooched from the US.